Discussion in 'International Politics' started by Scotlander, Sep 24, 2017. New Delhi: Pakistan on Sunday brandished the photo of a woman with facial injuries at the United Nations General Assembly on Sunday. The country’s Permanent Representative to the UN Maleeha Lodhi claimed the woman was a “victim of pellet gun injury in Kashmir”. The claim, it turns out, was a blatant lie. The woman in the photo is Rawya abu Jom’a, who was injured in an Israeli airstrike in Gaza City in 2014. The critically-acclaimed photo of a then 17-year-old Rawya was taken on July 22, 2014 by award-winning photojournalist Heidi Levine, who is based in Jerusalem. The photo was also tweeted on March 27, 2015 by Dr Ramy Abdu, whose bio on his verified Twitter account says he is the founder of Euro-Mediterranean Human Rights Monitor. While holding up the photo from her chair at the General Assembly, Maleeha Lodhi said, “This, Mr President, is the face of India’s democracy." Lodhi’s gaffe came as she was replying to External Affairs Minister Sushma Swaraj speech to the world body, where the latter asked Pakistan to introspect why it was lagging in growth. Speaking in Hindi for the second consecutive year at the annual UNGA session, Swaraj said India has risen despite being the principal destination of Pakistan's nefarious export of terrorism. "We produced scientists, scholars, doctors, engineers. What have you produced? You have produced terrorists... you have created terrorist camps, you have created Lashkar-e-Taiba, Jaish-e-Mohammed, Hizbul Mujahideen and Haqqani network," she said, adding that if Pakistan had spent on its development what it has spent on developing terror, both Pakistan and the world would be safer and better-off today. omya, Nilgiri, Som Thomas and 3 others like this. Pakistan caught with her Chaddi Down. Pundrick, omya, GSLV Mk III and 6 others like this. More humiliation for Terroristan. Can the moderators add Pakistan to the banned words list so if any article or post contains that word it is automatically replaced by Terroristan. brahmos_ii and Som Thomas like this. Pundrick, omya, GSLV Mk III and 7 others like this. They just don't get tired if getting mocked everywhere in the world .. haha. But would not stop spewing nonsense even after so much humiliation on every international platform . 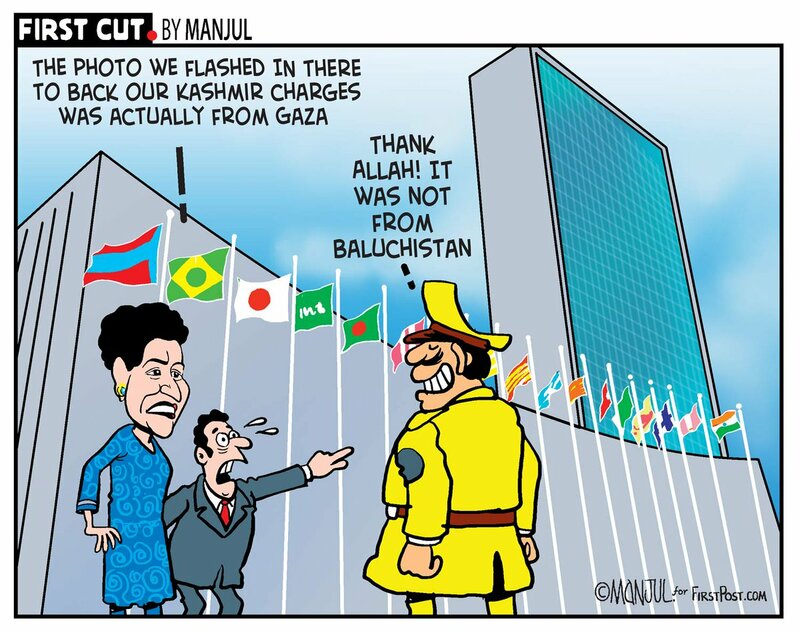 The world community in general and the UN does not take Pakistani rants seriously, their anti India propaganda and Kashmir issue, is just a face saving device and posturing for the viewers back home. The entire Pakistan establishment and their internal and foreign policy revolves around the anti India sentiment and funding and organizing terror organisations and ops against India. Pakistanis are obsessed with India and are blind, deaf and dumb to anything that is not aimed at spreading hatred and spouting venom against India. Their entire sense of reality and purpose stems from this obscured myopic view which is leading them into the path of self destruction. Pakistan is a ticking time bomb and it does not need any external trigger or stimuli but its own brand of extremism to consume it self........................Amen!!!! We should have just ignored them than stooping to their level. Lying at international level and having the thick skin to not even feel embarrassed is KG level training in Pakistan. The entire country is full of liars and they have no remorse. So no surprise at all. GSLV Mk III and Pundrick like this. As Ms. Swaraj mentioned, Pak's intention to export terrorism or Jihadism to India, it's high time that the very few Pak intellectuals left over there should think loud applying for Indian Citizenship or Asylum Visa in India. Jaihind!! J & K is our internal matter. Why is the UN challenging our sovereignty by allowing these foreign idiots to discuss? Kashmir is intergral part of India. Let the mullahs or talibs forget the letter 'K' in their alphabet. Morons.